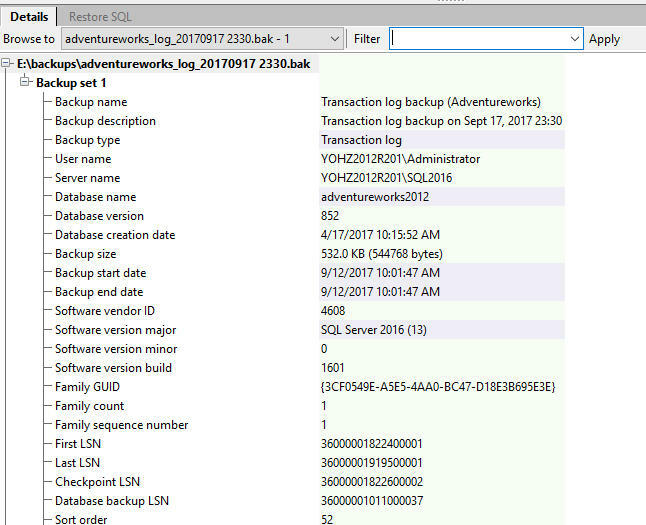 Get started with SQL BAK Explorer Try the FREE 14-day trial, and see how SQL BAK Explorer makes working with SQL Server Backup files easy and fast. 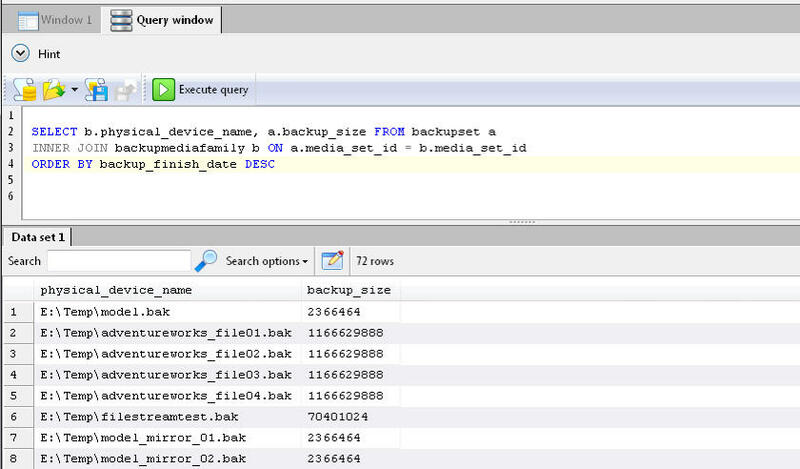 Faster restore times Quickly restore your backups using the SQL restore command generated by SQL BAK Explorer. The file hints quickly tell you how much disk space is required, and the generated MOVE options allow you to easily move the databases’ files around if required. Backup details with a single click Easily compare the backup details of multiple backup sets using the summary viewer. Need to know if the LSN values are in sequence? Just select the backups files and view the details . No need to run RESTORE HEADERONLY, RESTORE FILELISTONLY, or RESTORE HEADERONLY commands for each backup file. Faster backup details Details of files that have been read are stored, so that on subsequent reads, the details are retrieved from the cache instead of having to re-read the file again. Generate RESTORE SQL from cached data If your backup set is split over multiple files, the RESTORE SQL generated can list out all of the required files if they have been previously read. No need to manually list down each of the required files in the script. Easily locate the information you need Too much details displayed? Use the filter function to display only what you want to see. Ultimate flexibility in analyzing your backup file details Once SQL BAK Reader has read your backup file, it stores the details in a SQL Server Compact database. 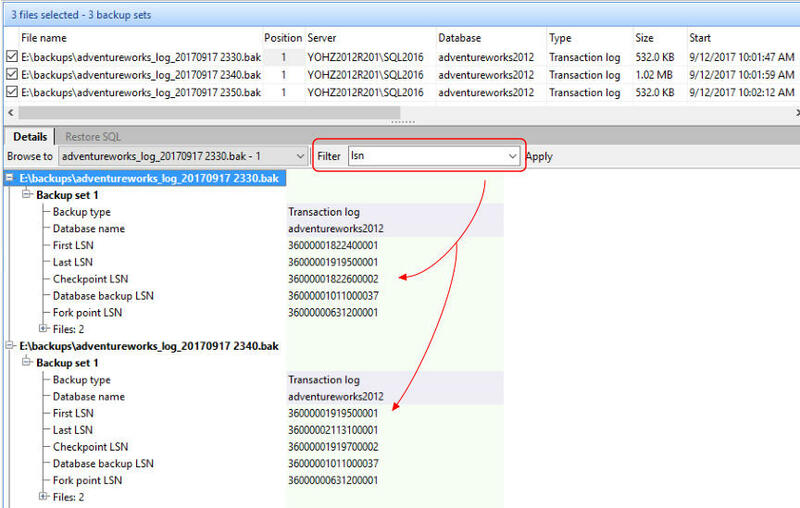 SQL BAK Explorer has a query window that allows you to run any SQL statement against the tables in this database. The backup details are stored in 5 tables i.e. • backupset • backupmediaset • backupmediafamily • backupfile • backupfilegroup The structure of these tables is similar to their counterpart in the SQL Server msdb database, so DBAs’ will feel right at home working with these tables.